My graphic breakdown of the 2011 LM-2 will save you some time in bringing the whole picture into focus. 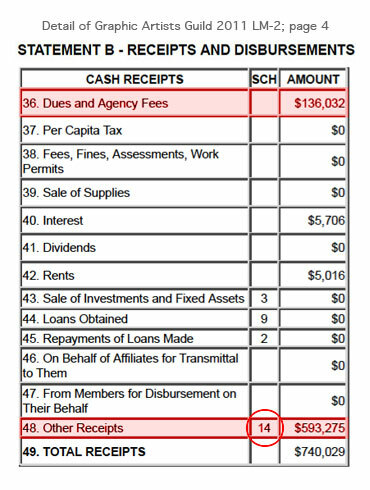 There just doesn’t seem to be an end to the mischief popping up in the news that keeps leading back to the Copyright Alliance and the Nickles Group LLC. If you paid some attention to the high profile lawsuits involving Apple, Samsung, and other tech giants that made headlines this year, then you’ve likely heard the term “patent troll” which refers to companies that amass large libraries of patents, then proceed to make a tidy profit by suing manufacturers that arguably infringe on those patents. Poorly defined, ambiguous software patents in particular have allowed trolls to threaten manufacturers with expensive lawsuits unless they agree to license the troll’s patents. In other words, trolls extort “protection money” from manufacturers in exchange for not suing. NPR / National Public Radio’s “This American Life” has an excellent exposé of trolls in program #441, When Patents Attack. There’s also a recent article posted by Mark Gibbs in Forbes, A Patent Troll Wants to Charge You for Emailing Your Scans! that contains a summary of the business of patent trolling. 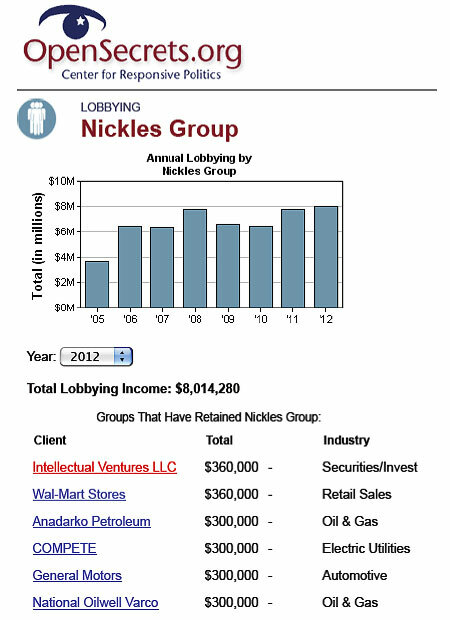 Enter the Nickles Group, LLC, and their copyright boutique side-business, the Copyright Alliance. 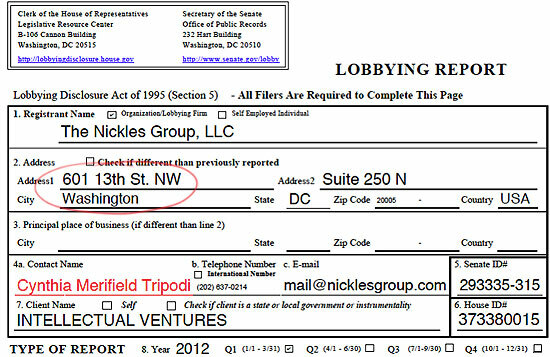 Below is a detail of the report filed by the Nickles Group on its lobbying for Intellectual Ventures; first quarter 2012. Should any of this matter to you? Only if you care about where some of your dues money* to the Guild ends up, and who’s being consulted when Guild officers make decisions on advocacy. 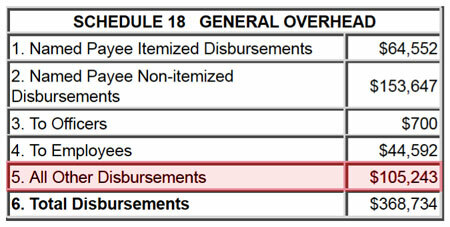 Here is a detail from the Guild’s 2011 LM-2 Annual Financial Report to the Department of Labor. Note the address, and where we’ve been sending $5000 every year. Detail of the Guild’s 2011 LM-2, schedule 16, Political Activities and Lobbying.